Rather than focusing vehicle-development and alternative-energy resources on finding different kinds of fuel, students and researchers at Georgia Tech are taking a couple steps back and looking at the emissions problem. The project currently being worked on involves a car that still operates on standard liquid fuels, but the kicker is the carbon emissions. The car will collect those and shuttle them back to a processing plant that can convert them back into fuel, taking out two birds with one stone. Eventually the team is looking into a long-term strategy that would involve creation of a truly and completely sustainable system. I'm still trying to wrap my head around the process as well, so take a gander at the press release below and see if you can figure out all of the eggheady scientific jargon. ATLANTA (February 11, 2008) —Researchers at the Georgia Institute of Technology have developed a strategy to capture, store and eventually recycle carbon from vehicles to prevent the pollutant from finding its way from a car tailpipe into the atmosphere. Georgia Tech researchers envision a zero emission car, and a transportation system completely free of fossil fuels. The Georgia Tech team's goal is to create a sustainable transportation system that uses a liquid fuel and traps the carbon emission in the vehicle for later processing at a fueling station. The carbon would then be shuttled back to a processing plant where it could be transformed into liquid fuel. Currently, Georgia Tech researchers are developing a fuel processing device to separate the carbon and store it in the vehicle in liquid form. The research was published in Energy Conversion and Management . The research was funded by NASA, the U.S. Department of Defense NDSEG Fellowship Program and Georgia Tech's CEO (Creating Energy Options) Program. "Presently, we have an unsustainable carbon-based economy with several severe limitations, including a limited supply of fossil fuels, high cost and carbon dioxide pollution," said Andrei Fedorov, associate professor in the Woodruff School of Mechanical Engineering at Georgia Tech and a lead researcher on the project. "We wanted to create a practical and sustainable energy strategy for automobiles that could solve each of those limitations, eventually using renewable energy sources and in an environmentally conscious way." Little research has been done to explore carbon capture from vehicles, but the Georgia Tech team outlines an economically feasible strategy for processing fossil or synthetic, carbon-containing liquid fuels that allows for the capture and recycling of carbon at the point of emission. In the long term, this strategy would enable the development of a sustainable transportation system with no carbon emission. Georgia Tech's near-future strategy involves capturing carbon emissions from conventional (fossil) liquid hydrocarbon-fueled vehicles with an onboard fuel processor designed to separate the hydrogen in the fuel from the carbon. Hydrogen is then used to power the vehicle, while the carbon is stored on board the vehicle in a liquid form until it is disposed at a refueling station. It is then transported to a centralized site to be sequestered in a permanent location currently under investigation by scientists, such as geological formations, under the oceans or in solid carbonate form. 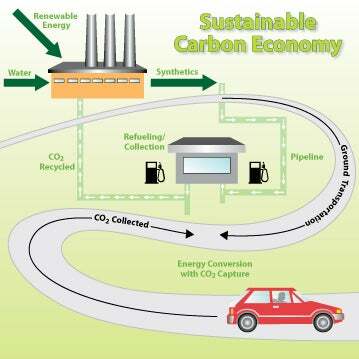 In the long-term strategy, the carbon dioxide will be recycled forming a closed-loop system, involving synthesis of high energy density liquid fuel suitable for the transportation sector. "We had to look for a system that never dilutes fuel with air because once the CO2 is diluted, it is not practical to capture it on vehicles or other small systems," said David Damm, PhD candidate in the School of Mechanical Engineering, the lead author on the paper and Fedorov's collaborator on the project. The Georgia Tech team has already created a fuel processor, called CO2/H2 Active Membrane Piston (CHAMP) reactor, capable of efficiently producing hydrogen and separating and liquefying CO2 from a liquid hydrocarbon or synthetic fuel used by an internal combustion engine or fuel cell. After the carbon dioxide is separated from the hydrogen, it can then be stored in liquefied state on-board the vehicle. The liquid state provides a much more stable and dense form of carbon, which is easy to store and transport. Now that the Georgia Tech team has come up with a proposed system and device to produce hydrogen and, at the same time, capture carbon emissions, the greatest remaining challenge to a truly carbon-free transportation system will be developing a method for making a synthetic liquid fuel from just CO2 and water using renewable energy sources, Fedorov said. The team is exploring a few ideas in this area, he added.